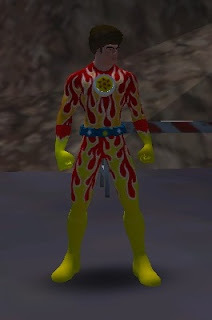 Champions Online is a super-hero themed MMORPG that grew out of the old City of Heroes and City of Villans games. I had heard a lot of rumblings about Champions Online when it was first in beta back in late 2009. Apparently, once it went into full release, Champions Online nerfed all of the classes, bringing them down from their near demi-god status. I remember various geek boards exploding with anger over this. People felt cheated, and it was the first time I have ever seen a gaming community that up in arms over something. How did Cryptic Studios, the creators of Champions Online respond? They threw it right back in the face of the Champions Online community and told the players that they had never intended to let the characters become so powerful. A rampaging river of angry gamers left Champions Online and vowed to never touch a game again with Cryptic attached to it. A year and a half later, we now see the game in its current state. I've stayed away from the game, despite hearing great things about the character creator feature. But, with Champions Online being free to play now, I figured I'd at least create a character to see what all of the fuss was about. With that, I give you my own superhero: Disco Inferno! Arriving in a nick of time to Millennium City, Disco Inferno fans the flames of justice with his chest-mounted strobe light. Should he find a mob getting loose and breaking the law, Disco Inferno will use his powerful flames, then it's "Burn, baby, burn" as the boogie starts to explode! And if he were to encounter a villain and engage in some groovalicious combat, he'd celebrate his victory by spamming every available /dance emote command. He can't get enough, so he'll have to self destruct. In all seriousness, I don't find the game interesting enough to keep on playing. The game play reminds me too much of Star Trek Online, which I couldn't stand. It's fun to create a character, but it looks way too cartoonish to me and the interface is atrocious. This isn't going to make me want to ditch World of Warcraft, despite Champions Online being touted as the "casual alternative" to WOW. It's a little TOO casual. The combat is laggy and squishy, which ultimately makes the game worthless, even in a F2P mode. Maybe DC Universe Online will offer some hope for pushing the superhero MMORPG model once all the post-launch kinks are worked out.